The Autobots and Optimus Prime are back in action, taking on the evil Decepticons, who are determined to avenge their defeat in the previous installment. 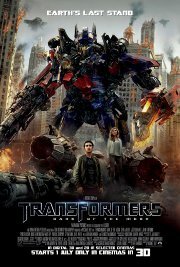 This time around, the Autobots and Decepticons become involved in a perilous space race between the U.S. and Russia, and once again Sam Witwicky has to come to the aid of his robot friends. Yes, there is a nasty surprise on the dark side of the moon. This film is releasing in both 2D and 3D, this is the 3D version. Michael Bay recommends you watch it in 3D, and they're begging the cinemas to keep the brightness turned up. Language Some, mildish, not frequent. Comments The violence is prolonged and somewhat intense but not bloody and largely unreal.